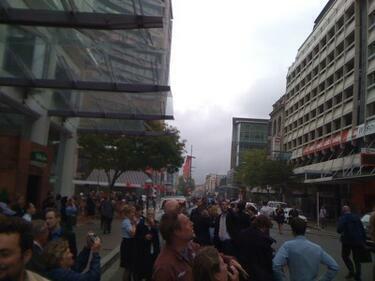 A photograph of concerned members of the public looking up at the Hotel Grand Chancellor, shortly after the 22 February 2011 earthquake. Many of the people in the crowd are structural engineers from all over the world who travelled to Christhcurch for an earthquake workshop. 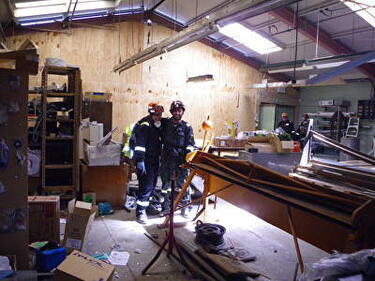 The workshop was just about to begin when the 22 February 2011 earthquake hit. A PDF copy of pages 312-313 of the book Christchurch: The Transitional City Pt IV. 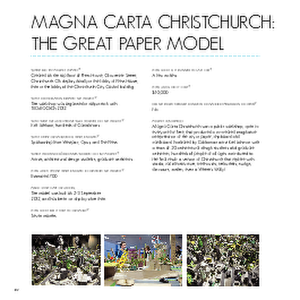 The pages document the transitional project 'Magna Carta Christchurch: The Great Paper Model'. 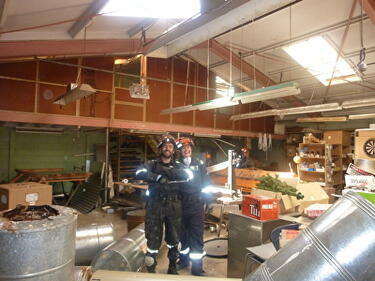 A photograph of members of the Wellington Emergency Management Office Emergency Response Team inside a workshop in Christchurch. 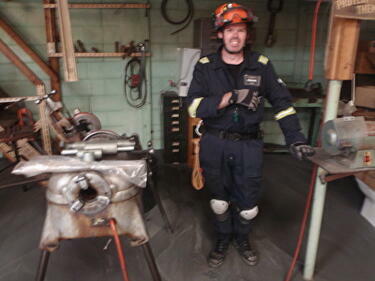 A photograph of a member of the Wellington Emergency Management Office Emergency Response Team team standing inside a workshop. 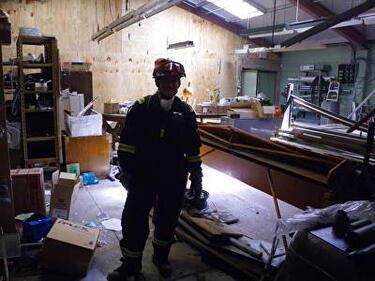 A photograph of a member of the Wellington Emergency Management Office Emergency Response Team standing inside a workshop. A photograph of Marie Hudson in Crack'd for Christchurch's workshop. Behind her, boxes of broken china have been stacked on a shelf. Hudson is wearing painters overalls and rubber gloves, and is holding a teacup. 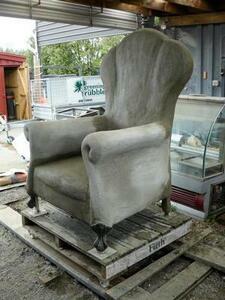 Crack'd for Christchurch comments, "The famous grey overalls. This all we would see Marie in for the next year." 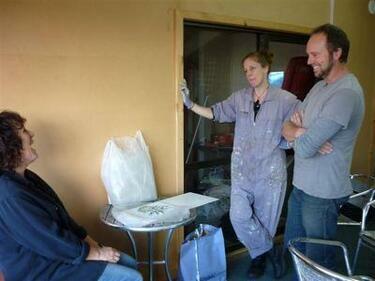 A photograph of Jonathan Hall, Marie Hudson, and Jenny Cooper in Crack'd for Christchurch's workshop. 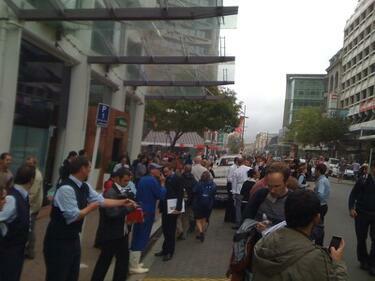 Crack'd for Christchurch comments, "It is August 2013, two and a half years since the big quake. 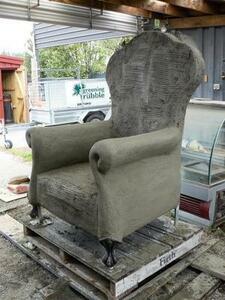 We have a plan, we have a tiny bit of funding, and we have commissioned the chair framework. 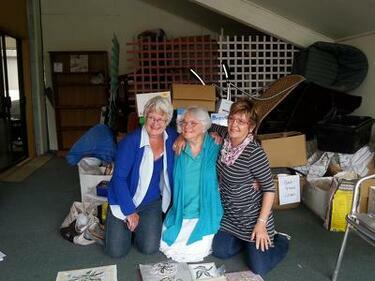 From left: Jenny Cooper, Marie Hudson, and Jonathan Hall (chair engineer of Greening the Rubble)." 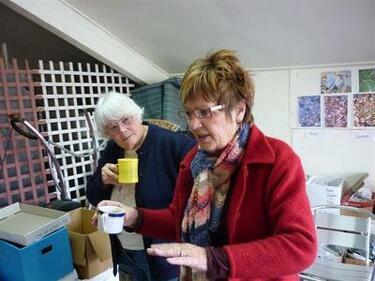 A photograph of two members of Crack'd for Christchurch in their workshop. Crack'd for Christchurch comments, "Many discussions about how to proceed - this is far more complicated than anything any of us have done." 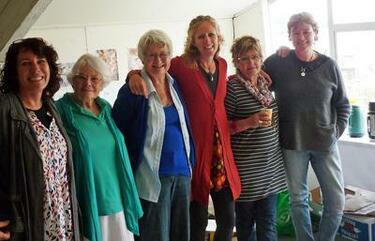 A photograph of members of Crack'd for Christchurch in their workshop in the Christchurch central city. In the background there are boxes of broken china. Crack'd for Christchurch comments, "From left: Shirley Walden and Marie Hudson." 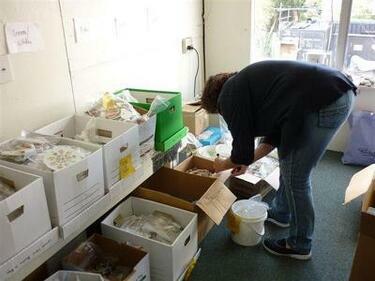 A photograph of Jenny Cooper labelling boxes of broken china in Crack'd for Christchurch's workshop. 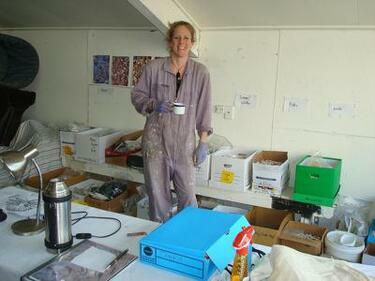 Crack'd for Christchurch comments, "Jenny Cooper always labelling, labelling, labelling." 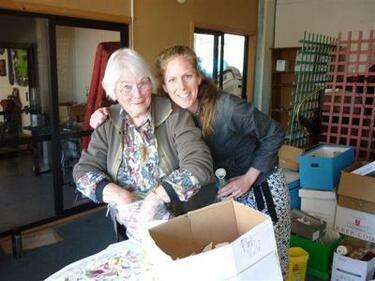 A photograph of Marie Hudson opening a box of broken china in a garage. Hudson is wearing painting overalls. Crack'd for Christchurch comments, "August 2013. 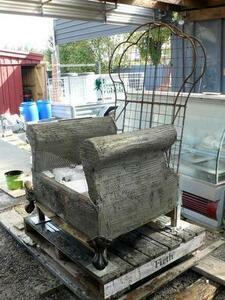 Moving into our new inner-city workshop...on the 2nd storey of a quake-damaged building. We could see daylight through the walls in places." 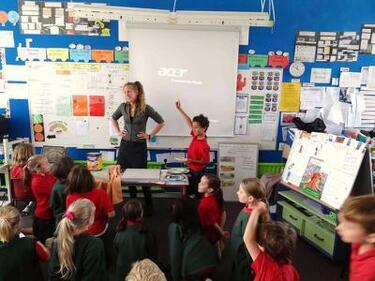 A photograph of a class at Oaklands Primary School. 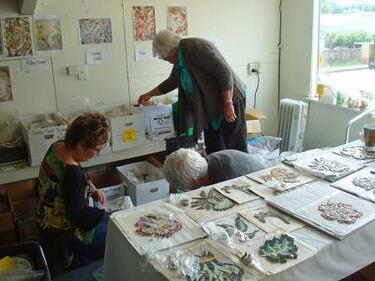 Crack'd for Christchurch comments, "Marie Hudson giving a mosaicking workshop at Oaklands School."